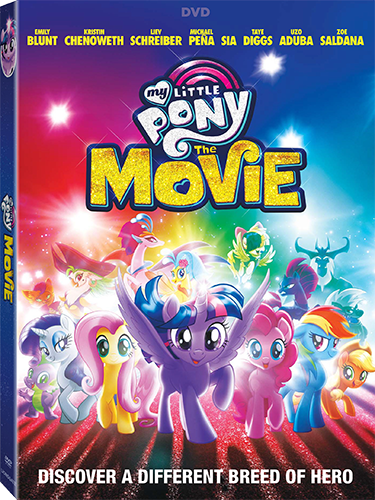 Join the “truly magical adventure” (Mike Reyes, CinemaBlend) of the Mane 6 and their new friends when My Little Pony: The Movie comes home on Digital December 19 and on Blu-ray Combo Pack (plus DVD and Digital), DVD, and On Demand January 9 from Lionsgate. Best friends Twilight Sparkle, Rainbow Dash, Pinkie Pie, Applejack, Fluttershy, and Rarity team up in their most epic adventure yet! 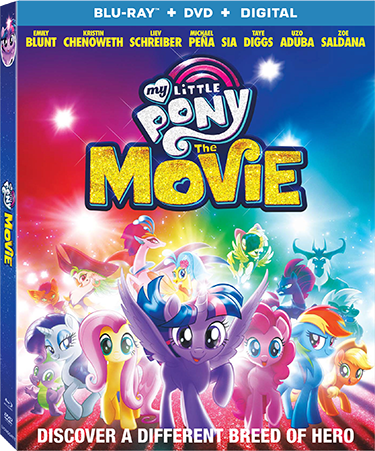 This new installment of the global phenomenon features the Mane 6 voices of “My Little Pony: Friendship Is Magic” accompanied by Golden Globe winner Emily Blunt (Best Actress in a Motion Picture – Musical/Comedy, Into the Woods, 2015), Primetime Emmy winner Kristin Chenoweth (Best Supporting Actress, “Pushing Daisies,” 2009), Golden Globe nominee Liev Schreiber (Best Actor in a TV Series – Drama, “Ray Donovan,” 2017), Michael Peña (The Martian, Ant-Man franchise), Sia, Taye Diggs (Chicago, “Private Practice”), Golden Globe nominee Uzo Aduba (Best Supporting Actress – Television, “Orange Is the New Black,” 2016), and Zoe Saldana (Avatar, Guardians of the Galaxy franchise).